In 2007, I graduated from UNH with a BA in English, minor in Vocal Performance. Forgoing a Master’s degree in Shakespearean studies at UMASS-Amherst (*phew! *), I decided to move from New Hampshire to New York City with my new boyfriend, Michael. We wanted to make music there, and we were young enough to think it wouldn’t be that hard to move there. In August, Michael left for the city to find work, crashing on a stuffed chair & ottoman at his friend’s cramped apartment in Crown Heights. Certainly, a less than ideal situation. I moved back up north to the Lakes Region, and saved all the money I made substitute teaching at an elementary school. A heart for every bird. Living at home again, I was lonely & restless. 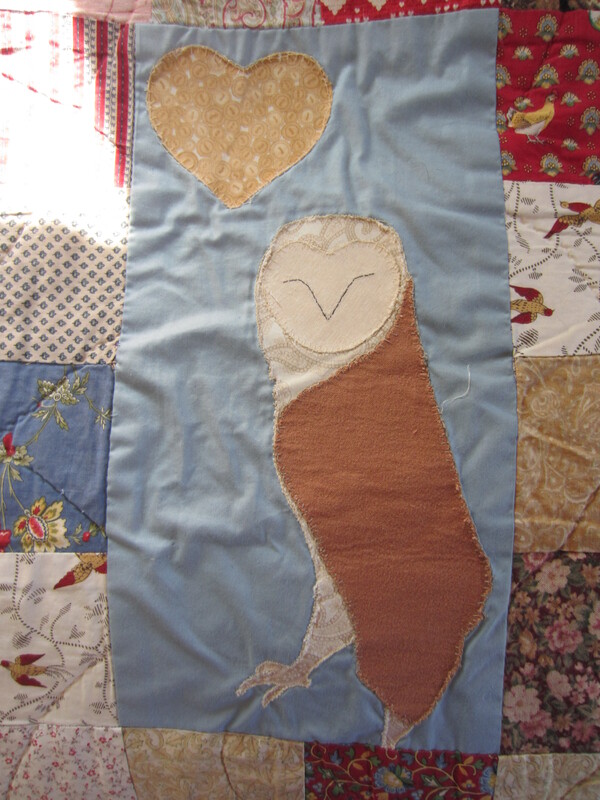 When I wasn’t riding horses at my friend’s barn, I was pulling together this owl quilt for our new bed (which ended up being an old queen-sized mattress on the floor). I refused to use my mom’s sewing machine; I wanted a hand-sewing project that could tick away the minutes, hours, days until I was with Michael in our new city life together. 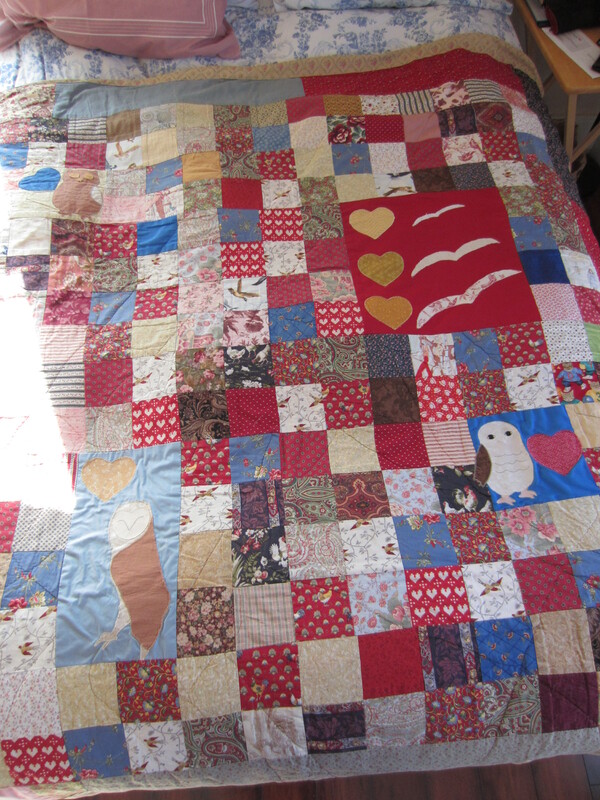 This was my first, large-scale quilting project of my own. 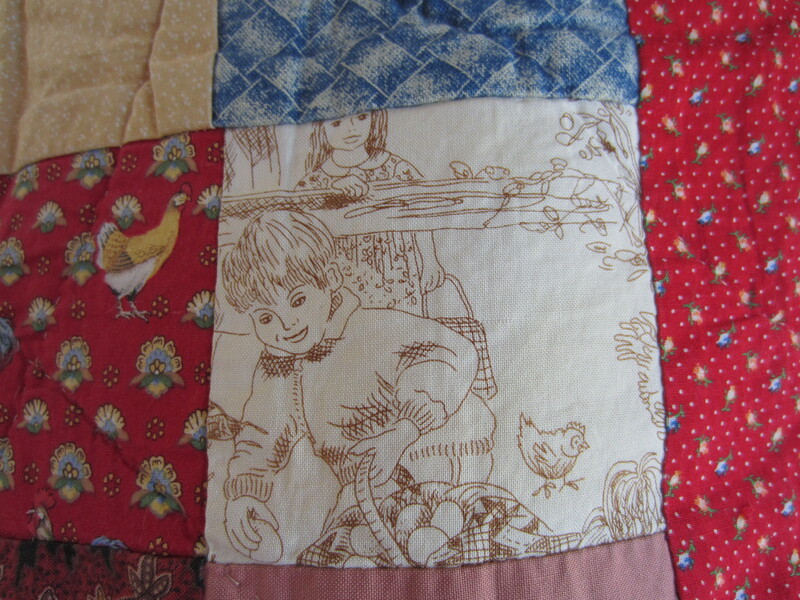 Before this quilt, I had only done some baby quilts and/or helped my mom with her quilts. My family’s house was a mile away from the renowned Keepsake Quilting store, so I had lots of great fabrics to choose from. 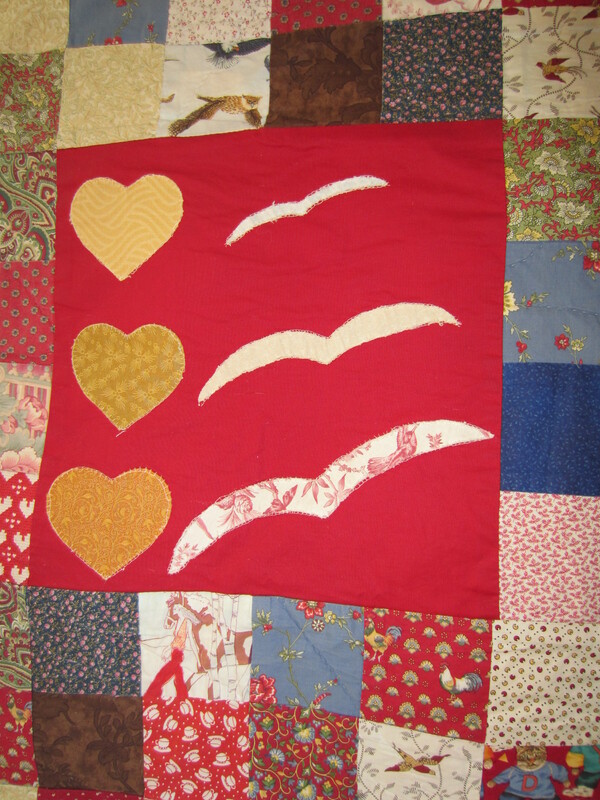 Originally, this quilt was supposed to be a Slavic/nesting doll red theme. Instead, it came out more folksy and with owls. 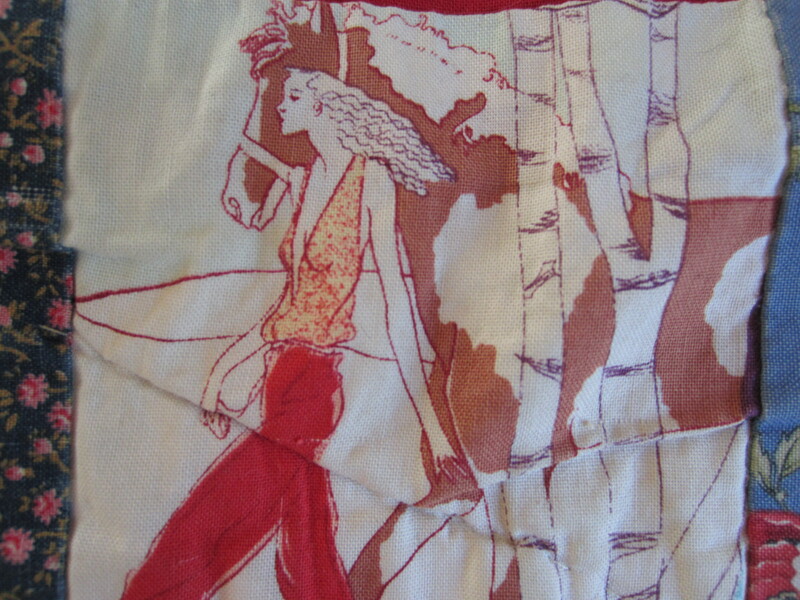 I still want to do that Slavic quilt someday, but I’m ever so happy to have this red folk quilt. I finished the quilt top a week before I left for NYC in November. When I moved to the city, Michael met me at the Fung Wah stop on Canal Street. There were so many people, and I had two big duffel bags. Michael grabbed a bag and then grabbed my hand and pulled me through the melee. I then had my own week of sleeping in a less-than-ideal situation (sleeping bag on a piece of thick plywood that was vaulted over the TV?) before we found an apartment in Bensonhurst, a few stops short of Coney Island. Bensonhurst, Brooklyn’s old Little Italy neighborhood, had a great bakery, butcher shop and pizzaria. It also had a lot of men wearing velour track suits unzipped to show thick gold chains & chest hair. Michael got a job at a small, dusty lighting company in Sunset Park, and I had a myriad of secretarial jobs that always took me on the N train into Manhattan. I tackled two big books that year commuting: Pynchon’s “V” and Tolstoy’s “Anna Karenina,” which really meant that I improved my balance & biceps. 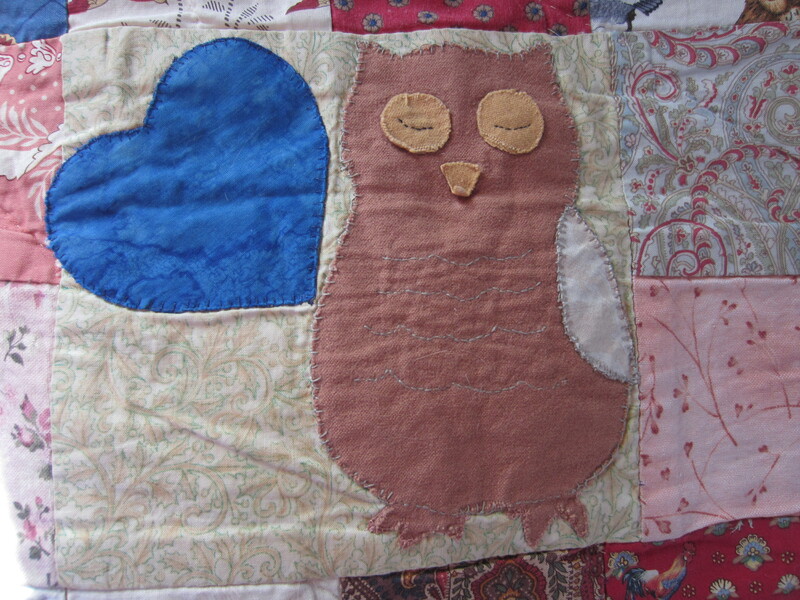 It wasn’t until I was temporarily unemployed in March of 2008 that I was able to complete the owl quilt. There were no good quilting stores around (it seems that people just buy everything they need in NYC), so I had to get creative. I used an old fleece blanket for the batting, and found a cheap, queen-size sheet for backing and borders. 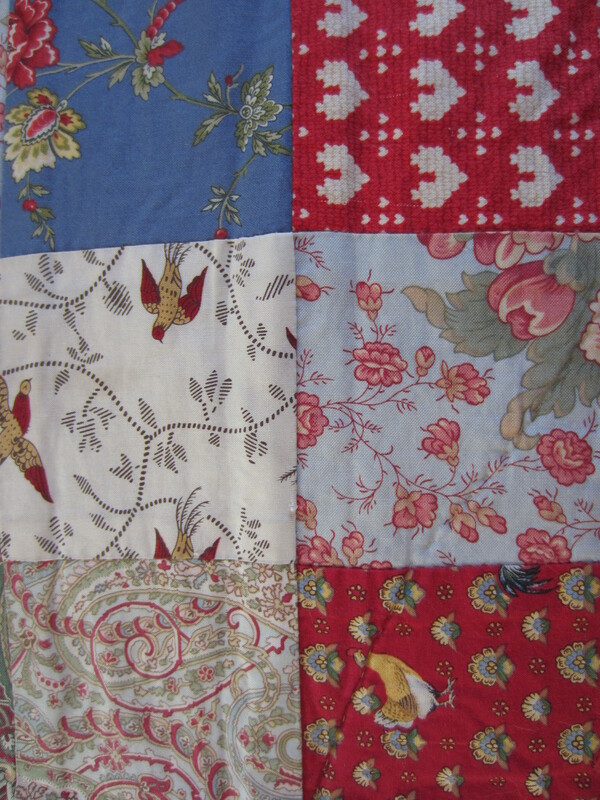 This quilt is six years old now. When Tilly was a kitten, she ate off one of the owl beaks. I was able to find another smidge of that brown felt at my family’s house a year before the house was foreclosed on and my family, more or less, broke itself up. I just haven’t been able to fix that beak because I’m torn between wanting to right the owl’s face and wanting to remember the memories of how the owl got to look like this. 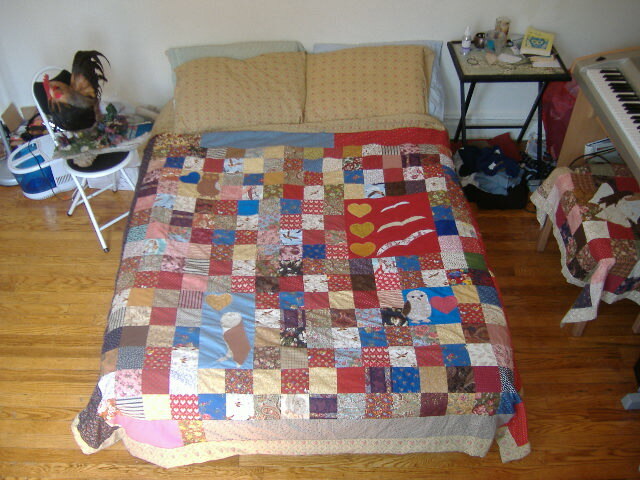 With this quilt, I stitched in all of my imaginings of Michael & I growing old together. I stitched in all the cats & dogs and confessions and folded laundry , promises and music and babies, naps and New England and fresh air. Six years later, I love that all those dreams I sewed in there are still revealing themselves, still becoming. I have grown up a lot since 2007. This quilt is a map that shows everyone: This is where I started my own journey. This is where Michael meets Jessica and life begins. 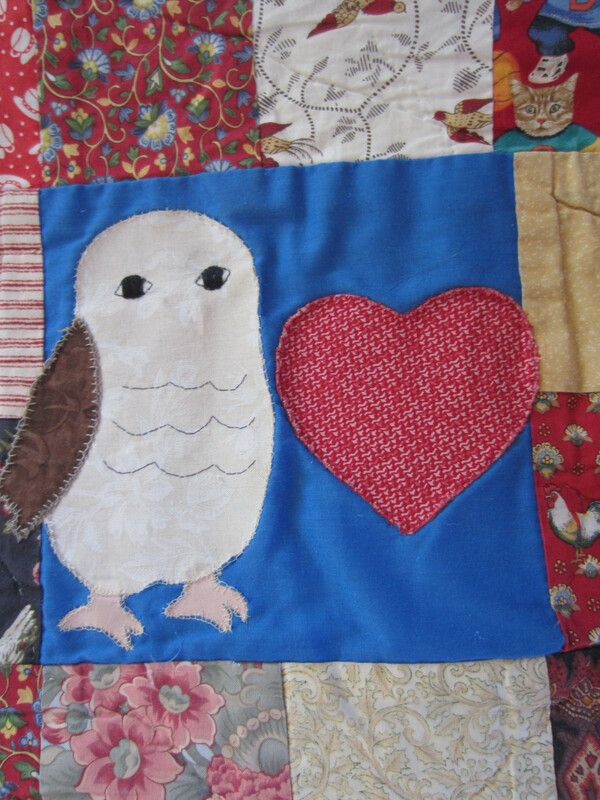 I love the stories behind all the owl squares! This is an amazing quilt. You are so talented and resourceful! I do think that owl needs a beak!